The Stade Pierre Mauroy is clad with IMAGIC WEAVE® transparent media facade made from 2,046m² of HAVER & BOECKER architectural wire mesh. There are three different areas of varying resolution, each providing the optimum requirement for playing the media required. 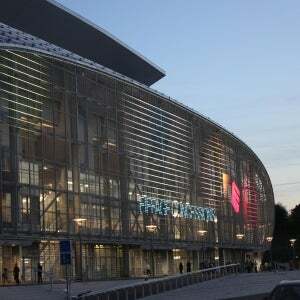 The unique design of the stadium, located on the Boulevard de Tournai in Lille, France, is by architects Valode & Pistre and Pierre Ferret. Multi-functionality is the key to this stadium. As well as being a venue for Euro 2016, the stadium is the new home to OSC Lille football club. The stadium will be used for football and rugby matches, along with other events such as concerts and indoor sports competitions like handball, basketball and tennis. For this extraordinary stadium, the architect wanted the external view to be as exciting and distinctive as the inside. The elliptical main façade of the Stade Pierre Mauroy is covered with 2,046m² of architectural wire mesh manufactured by HAVER & BOECKER. The chosen weave type, DOGLA-TRIO 1030, is not only functional but also aesthetically attractive. During the day, the semi-transparent surface of the stainless-steel wire mesh creates an elegantly gleaming appearance in the sunshine. The main façade especially reflects the urban nature of the new stadium. IMAGIC WEAVE® can easily transform into a multimedia attraction, for example to enhance events taking place at the stadium. With a height of 20m and a length of 120m, the media façade has 70,000px covering the entire surface of the external envelope. Within the whole facade there are three different resolution areas; a rectangular high-resolution screen for promotional videos, an elongated medium resolution ‘ticker’ style screen and a large background screen with a low resolution, which can be used for graphics or creating various lighting moods. The 20m-high mesh panels are tensioned using tension profiles, clevis screws and pressure springs. The border elements of the elliptical surface were custom fitted using welded flat steel, special eyebolts and pressure springs. A total of 4.3km of powerful LED profiles were installed by abseilers to 2,046m² of architectural wire mesh. The installation of the LED and architectural wire mesh components, as well as the pre-installed power and control racks for the media façade, was carried out under the guidance of the HAVER & BOECKER technical team. In a nearby control room, the complex video control system is realized with an e:cue lighting control server FX and 25 e:cue video micro converters by Traxon Technologies. Using wireless technology, it can simply and playfully be controlled using a smartphone or tablet PC. All three areas of the media façade can be controlled separately using video content or can be used as single units for external representation. IMAGIC WEAVE® transparent media façade converts the stadium area in front of the ticket counters into a multimedia attraction for fans, visitors and passers-by.